A porringer is a shallow bowl, between 4 and 6 inches (100 to 150mm) in diameter, and 1½" to 3" (40 to 80mm) deep; the form originated in the medieval period in Europe and was made in wood, ceramic, pewter and silver. They had flat, horizontal handles. Colonial porringers tended to have one handle, whereas European ones tended to have two handles on opposite sides, on which the owner's initials were sometimes engraved, and they occasionally came with a lid. Porringers resembled the smaller quaich, a Scottish drinking vessel. One can discern authentic pewter porringers in much the same way that silver can be authenticated from the touch marks that were stamped either into the bowl of the porringer or on its base. Wooden porringers are occasionally found from excavations; e.g. 16th-century example from Southwark and 11th century from Winchester. The most famous colonial porringers are probably those made by Paul Revere. In more modern times, some manufacturers of porringers have produced them without handles. These types of porringers appear to be deep bowls, with the sides being nearly totally flat. Porringers are also used less and less, as a bowl will suffice for most people; porringers, however, are still circulated, mainly as a Christening-gift. 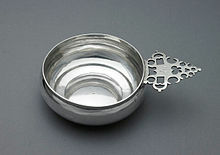 A second, modern usage, for the term porringer is a double saucepan similar to a bain-marie used for cooking porridge. The porridge is cooked gently in the inner saucepan, heated by steam from boiling water in the outer saucepan. This ensures the porridge does not burn and allows a longer cooking time so that the oats can absorb the water or milk in which they are cooked more completely. Also the porridge does not need stirring during the cooking process, which means the oats maintain their structural integrity and the porridge has a better mouthfeel and texture. The lower heat may also degrade less of the beta-glucan in the oats, which gives oats their cholesterol-lowering properties. Porringers were also made out of red earthenware clay in a type of pottery that is called "redware" today but called "earthen" during colonial and Early America. These would have the typical strap or pulled handle that is familiar on mugs and cups today. Some collectors or materials historians also call what resembles the pewter porringer a "bleeding cup". ^ Rita Susswein Gottesman (April 3, 2009). "Flashback: Evolution of New York Silver Porringer Handles". Collectorsweekly.com. Retrieved May 1, 2011. ^ Robin Wood (2007). The Wooden Bowl. Stobart Davies Limited.